1. Purchase the Registration Form for a fee of Rs. 1000/- from the School, duly fill it and submit it at the school. 2. Download the Registration Form from our website, take a print, duly fill it and submit it at the School, along with the Registration Fee of Rs. 1000/-. 3. Register Online via the Online Registration option available on our website. You would be required to pay the Registration fee of Rs. 1000/- through our online payment gateway. The HDFC School's Core Team looks forward to meeting the parents. This provides an opportunity for you to get acquainted with our school and make an informed decision about the future of your child. Admissions open for Nursery, LKG, UKG and Classes I-VII. 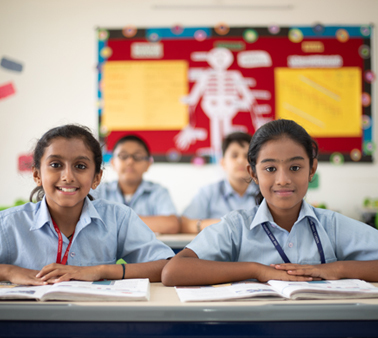 The HDFC School also provides admission to children with Special Educational Needs. Exclusions: Uniforms, Books, Transport Fee. There will be an additional charge for post-school activities, excursions/school trips and any other optional activities. Fee Revision: The fees will be cost-adjusted every year. 3) Only Security Deposit is refundable when the child leaves school or successfully completes Class XII.